Motion Disabled has been shown across the UK, South Korea and in the USA, including the Smithsonian International Gallery during the summer of 2010 where over 500,000 visitors viewed a joint exhibition entitled Revealing Culture organised by VSA – Washington D.C. USA. During December 2010 many thousands of people viewed Motion Disabled across 17 countries. From the megamalls of Saudi Arabia to a street festival in Argentina Motion Disabled rolled out worldwide on December 3rd in an event promoted by VSA and also DaDaFest in the UK. Sponsored by Teesside University, The Wellcome Trust and Arts Council England - Motion Disabled continues to grow exponentially. Please see the sub menus for more detail including video as well as www.motiondisabled.com which is an extensive site detailing the project fully. The following video showcases a short clip from the Motion Disabled project. The disabled actors represented include Mat Fraser, Richard Brooks, Steve Graham and approx ten others. The actors physical motion has been captured and attached to simplistic avatar representations of the actors. Please see the video below and www.motiondisabled.com for more detail. 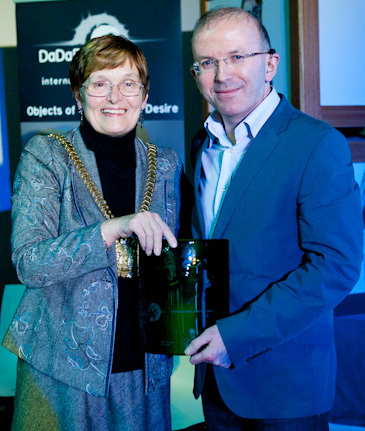 At the conclusion of DaDaFest 2010 Simon Mckeown was awarded DaDaFest International Artist of the Year by Ruth Gould (Chief Executive) and the festival Artistic Director Garry Robson. I would like to thank the very many people who have been involved in the creation, support and promotion of Motion Disabled. Many thanks to all the actors involved in the work, not least the latest contributor Claire Cunningham. My thanks also to members of the crew, especially Craig McMullen who oversaw the entire 3D production from start to finish, a huge task! Nigel Crooks of Teesside University designed and produced all the sound that accompanies the work and it really brings the animation to life. Some of the production is documented aswell as many interviewsby Mark Buschbacher, of Teesside University. Thanks to the Wellcome Trust and to Teesside University for supporting this project. To Geraldine Simonnet and all her staff at VSA in the USA who were amazing during the international production! To all the promoters, especially Jo Verrent and all the venues who have kindly exhibited the work to date. To Ruth and Garry at DaDaFest – my thanks. Lastly my special thanks to Dr Paul Darke of Outside Centre. Paul came aboard as the organiser and first motion capture subject for Motion Disabled. His work, support and advice has been invaluable.